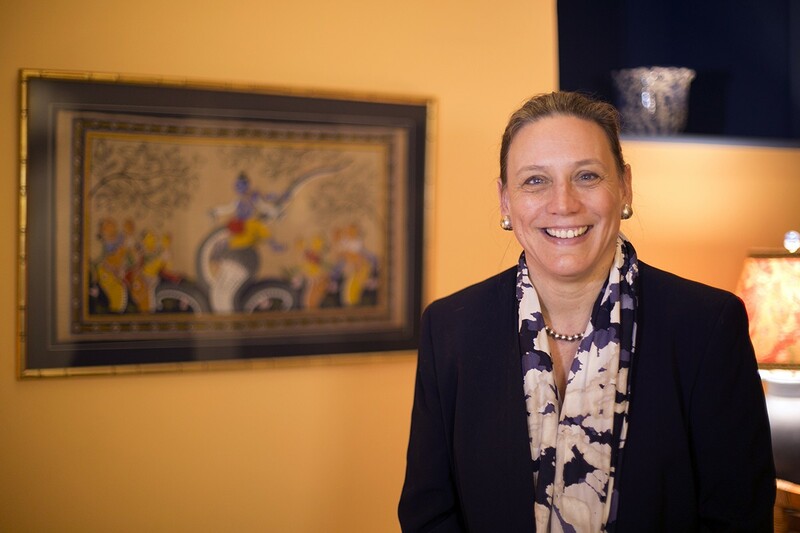 President-elect Laurie Patton will take the helm at Middlebury College on July 1, 2015. When Ron Liebowitz steps down from his post as president of Middlebury College next June, he'll be succeeded by a woman — the first female president in the college's history. In an announcement today at Mead Chapel, the board of trustees introduced Laurie L. Patton as the 17th president in the liberal arts college's 214 years. The board selected Patton, 53, from a pool of 260 candidates. The board unanimously voted to approve Patton's appointment at a meeting Tuesday morning. "I can't wait to get here," Patton told students, faculty and staff at Mead Chapel at noon, after praising the college for its innovative spirit, commitment to education and environmental stewardship. "I am delighted to begin work with you as your 17th president," she told the crowd, before riffing on a Wendell Berry quote. "Here, in all the glorious places where Middlebury lives and thrives, we will become together who we are meant to be." A religion scholar and translator of classic Indian Sanskrit texts, Patton earned her BA from Harvard University and doctorate from the University of Chicago. She currently serves as dean of Duke University’s Trinity College of Arts and Sciences, the university's largest undergraduate school. In a statement from the college, Middlebury's board chair, Marna Whittington, lauded Patton as an outstanding choice for Middlebury's next president. “She lives the values of Middlebury, and I am confident she will provide the leadership and innovative thinking required to maintain the positive momentum and success Middlebury has experienced during Ron Liebowitz’s tenure as president,” said Whittington. Later, in a press conference, Whittington noted that the board heard a clear desire for a female president from college constituents during the search process; nationally, women head only 26 percent of colleges and universities. Prior to her work at Duke, Patton taught religion at Emory University in Atlanta for 15 years. She's the author of nine scholarly books on South Asian history, culture and religion, as well as two volumes of original poetry. She's married to Shalom Goldman, a professor of religious studies and Middle Eastern studies at Duke; Goldman will become a tenured professor in Middlebury's religion department. Liebowitz announced his decision to step down as president last December. He'll have served 11 years in the role when that decision takes effect on June 30. He has shepherded the college through a number of changes, including the acquisition of the California-based Monterey Institute of International Studies and the creation of 23 new sites for study abroad. During his tenure, the college sent two teams to the U.S. Department of Energy's Solar Decathalon competition and created the Center for Social Entrepreneurship — both indicative of a new focus on innovation, entrepreneurship and technology. Under Leibowitz's watch, the college's endowment grew — despite a national recession — from more than $700 million to $1 billion. "The reputation of Middlebury has never been at a higher point," said trustee Al Dragone, Jr., on Tuesday. Dragone chaired the presidential search committee. "Academically and financially we are seen as a leader in higher education. The stability we currently enjoy is in no small part due to Ron’s leadership over the last 10 years." In a press conference this afternoon, Patton said that aggressive fundraising aimed at further growing the endowment is on her to-do list. She expressed a commitment to encouraging socioeconomic, sexual and racial diversity on campus, and spoke of her collaborative approach to leadership. She also noted that given the growth and expansion Middlebury has experienced in recent years, one of her jobs will be to help the college make sense of its multiple identities. "I think the key question there is, how can the Middlebury identity expand, and still remain the Middlebury identity?" said Patton. She takes office on July 1, 2015.